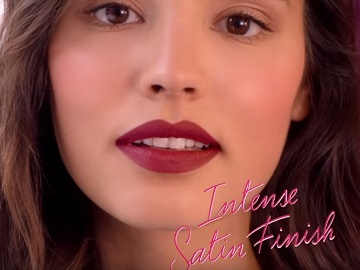 Bourjois advertises the new Rouge Fabuleux Lipstick in a new spot, part of a worldwide campaign. The advert features a young woman stopping for a minute on her way out in the city to apply the shade no. 12 of the Rouge Fabuleux Lipstick, which is – according to the brand, “creamy,” “lightweight,” with an “intense satin finish,” and “long-lasting,” providing up to 10 hours of intensive color. “Colour with no compromise,” a final onscreen line reads, before the voiceover says the French label’s tagline, “Joyfully Parisien”. The soundtrack music is the French version of the single “LoveKraft”, titled “LoveKraft Melodie,” by synth pop band My Dear (composed of real-life couple Raw Man and Blanche), released earlier this year, on October 18. Bourgois states that the Rouge Fabuleux Lipstick features a high concentration of saturated pigments, that offers dazzling colours, from nudes to vibrant reds. “Creamy and comfortable and enriched with Marula oil, its precious formula nourishes, moisturises and takes daily care of the lips”. The lipstick is available in 15 different shades, from a creamy beige and a light caramel to a soft pink, to a bright pink, to a highly saturated red, to an intense, bluish crushed plum, to a deep and dark plum for addicts of bold colors.